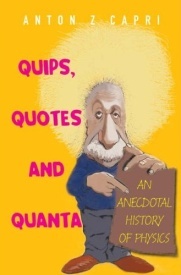 Anton Z Capri's Quips, Quotes and Quanta bears the subtitle An Anecdotal History of Physics - accurately reflecting not just the book's theme but also its structure. The history of physics is traced through a series of anecdotes from the lives of many famous, and not so famous, physicists. Thus the development of the science is revealed. From Galileo to Feynman, both physicists and physics itself are pictured in a new light. The anecdotes are assembled from stories passed to Capri by his colleagues. The book's material is organised in a chronological fashion and the threads leading the reader through the book are well deployed. Reading about who was working on one development with whom at the same time as a different team was discovering something else was enlightening. Unfortunately the quotes are not referenced, so determining the accuracy of the stories and associated quoted material may be difficult for those who might want to use this book to delve deeper into this area. Also, the book lacks a bibliography. In reading Quips, Quotes and Quanta, one difficulty became apparent: it has not been edited very well. The mechanics of good writing are not in place and I found myself reading the same lines several times to figure out what information the author intended to present. Otherwise, the book is an easy read of 194 pages. Quips, Quotes and Quanta is not for the general reader but people with some background in physics, astronomy or related science may find it interesting, especially for the quoted material. It has already been a topic of discussion in my department at the university where I work.